This was part of a game that I made together with Basegames. Basegames is a small company setup by the Mediacollege Amsterdam. They have their students work in there for real clients to be able to fill up their Portfolio, and get some experience before leaving school. While I was working here, we got a job from One Big Game. One Big Game was in contact with the author of the famous Rubik's cube. And we were asked to develop a game, using the visual style of the original Rubik's cube. They wanted to make a "Wario Ware"-like game, using Retro games. Recreating the old school games, and updating them with new gameplay, that fits the fast gameplay element, exactly how Wario Ware does it. Ofcourse, all that had to visually fit the Rubiks Cube as well. In total we had to make 5 games, and a "Hub" that connects each minigame. In total I got to develop 2 out of 5 games for this project, as well as being involved in creating the Hub, in a later stage, the Hub was handed over to another team mate, to finish and wrap the game up. 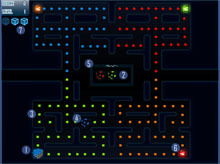 The first Game I got to develop was a version of the well known Pacman. I got the briefing as a single image with gameplay explanation written on it. As can be seen in the following image. (text on the image is in Dutch). the player collects a color, when collected, player changes to that color, and he can pick up the blocks with the same color. 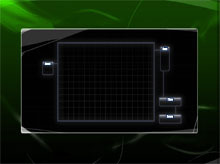 The player needs to collect all blocks in the level in order to continue to the next one. But ofcourse there is an enemy that will stand in his way of finishing easy. These enemy's are shaped as Rubik's Cubes, and each represents a side of the Cube. If the player is the same color as the enemy, he can take him on, otherwise it's advised to keep far away from them. Arrow keys - steering "pacman"
I hope you enjoy the game, again, as always, feedback is well appreciated. Contact details are on the about page.